Esther Geller exhibited her encaustic paintings for about 70 years. During a career spanning 75 years, Esther Geller was a well-known encaustic artist, using a mixture of pigment and hot wax – a substance considered far more difficult to work with than oils or acrylics. Given that challenge, Ms. Geller worked on an impressive scale, producing exceptionally large paintings that were splashy and colorful. 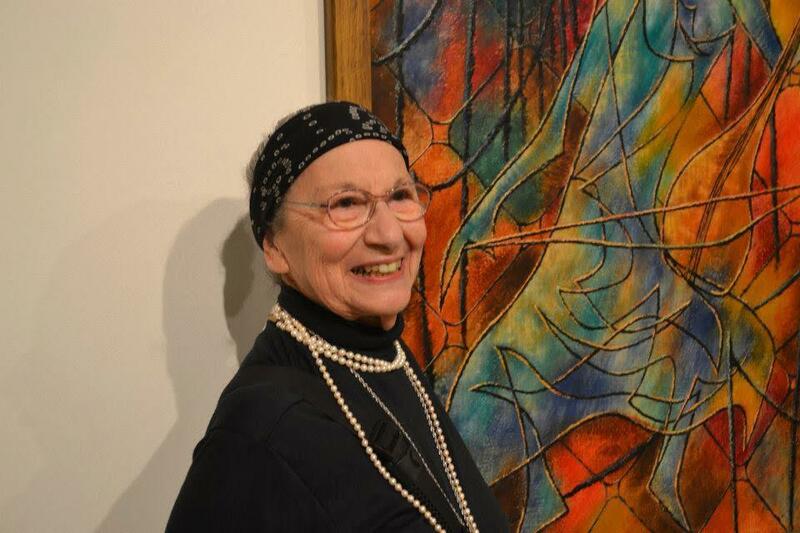 Ms. Geller, who exhibited her abstract art in the 1940s alongside the work of the group known as the Boston Expressionists, died in Hebrew Rehabilitation Center in Roslindale Oct. 22 of complications from a fall. She was 93 and had lived in Natick for many years. An experimental artist, Ms. Geller was always trying new methods, Cone said, such as using a charcoal lighter to melt wax while she worked. Ms. Geller also worked in watercolors, and many of her paintings featured figures that emerged from abstract backgrounds. Nearly until her death she sketched nudes with a group of artists who meet regularly in Wellesley. Because of that, she planned and sketched her work before picking up her brush. Ms. Geller was 16 when she began taking classes at the School of the Museum of Fine Arts. While there her work caught the eye of the renowned artist Karl Zerbe, a German immigrant. 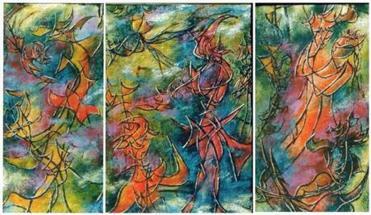 A key member of the Boston Expressionists, he became her mentor and they taught encaustic together. She later recalled that she became part of the Boston Expressionists group only through association. Ms. Geller used a mixture of pigment and hot wax when creating her artwork. When she was a teenage student at the school, she and two friends rented a tiny apartment in the school’s basement that doubled as a studio. After a day spent painting, the three girls often “ran up the stairs of the old Opera House to see the ballet,” said Ms. Geller’s friend and former roommate, Cleo Lambrides Webster of Brookline. Ballet was a particular passion for Ms. Geller, who had studied dance as well as painting. “Back then you could pay 50 cents, then go up to the balcony to kneel and look down at the stage,” Webster recalled. Even though Ms. Geller “gave up dance for art, she always looked like a dancer. She wore her hair in a bun, she wrapped her hair in a scarf. She had a wonderful fashion sense,” said her daughter, Hannah Shapero of Falls Church, Va., who is known as Pyracantha or Pyra. Ms. Geller also crafted jewelry from brightly colored stones and gems and was known for the beaded necklaces she wore with her black turtleneck sweaters. In 1945, she married the neoclassical composer Harold Shapero. According to family lore, they were introduced by mutual friends while standing in front of a John Singer Sargent painting at the MFA. Thanks in part to a Cabot fellowship that Ms. Geller was awarded for her work, they moved to Rome for two years after living in New York. In 1951, they settled in Natick and her husband joined the faculty at Brandeis University, where he led the music department. He died in 2013. His work at Brandeis and his association with composing luminaries such as Leonard Bernstein, Andre Previn, and Aaron Copland meant Ms. Geller often was called upon to entertain or attend performances. She was devoted to both visual and performance art, friends said, and rose to the task. Esther Bailey Geller was born in Boston and grew up in Roxbury, the third child of Gregor and Fanny Geller. Her father, a property owner and landlord, often delivered her to early classes at the MFA. Though the world of fine arts was dominated by men at the time, “she was really into art from early on, and her father supported her all the way,” said her daughter, who is an artist and illustrator. A service has been held for Ms. Geller, who taught art classes at the deCordova Sculpture Park and Museum in Lincoln, where her work is part of the permanent collection. Her work is also at the MFA, the Addison Gallery of American Art in Andover, and at Danforth Art in Framingham. When Erica Ball, founding board member of The Center for the Arts in Natick, realized how many paintings her longtime neighbor had stored in her house, she insisted on organizing a show that turned out to be the last that Ms. Geller, who had been ill for some time, would attend. Kathleen McKenna can be reached at kmck66@verizon.net.